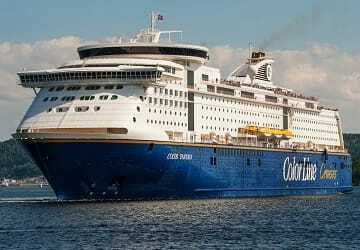 Color Fantasy was put into operation by Color Line in 2005 and at the time was hailed as the world’s largest cruise ferry. The vessel can carry up to as much as 2750 passengers and 750 vehicles at one time. Spread over its 16 decks the Color Fantasy offers numerous high class amenities for passengers to enjoy during their crossing, either relax in the Color Spa and Fitness Centre or enjoy one of the two shows put on in the Fantasy Show Lounge, dine at one of the eight restaurants onboard, the Color Fantasy really does have everything. Color Fantasy boasts superb onboard cabin accommodation as you would expect from a cruise ferry. There are 14 different types of cabins to choose from ranging from the spectacular ‘Owner Suite’ the ships most luxurious cabin with large windows with a stunning view of the ocean to the ‘Promenade View’ equipped with bunk beds. All 1021 cabins onboard come equipped with ensuite bathroom, TV, minibar and a telephone. Color Fantasy offers all the dining options you would expect on a cruise ferry. The options are endless from the Oceanic a la Carte restaurant with spectacular views of the ocean and an extensive menu for breakfast lunch and dinner, to something lighter and less formal the Tapas Bar is open for lunch and dinner serving classic and exotic light dishes. The Gourmet restaurant, Mama Belle Pizzeria and a self-service buffet offer other options. Color Fantasy has a selection of bars to choose from serving alcoholic beverages with some light snacks on offer too. If you prefer something more relaxed make yourself comfortable in the Observation lounge with panoramic views that can be enjoyed with the tones of classical and jazz music. On decks 6 & 7 of the promenade you will be able to find Color Fantasy’s variety of shops offering duty free items such as, tobacco, alcohol, cosmetics, food, clothes and other selected items at discounted rates. The ship is wheelchair friendly with disabled parking available close to the lifts. As well as this there are two types of disabled cabins available onboard. Please Note: Whilst we have taken great care in making our Color Fantasy guide as accurate as possible, onboard facilities, services and entertainment may vary depending on the date and time of year that you travel, facilities mentioned may change without notification and ferry companies reserve the right to operate vessels other than those mentioned at time of booking without prior notification. "Sailing to Norway and back"
Everything worked out great. Gladly again!